If an employee has not clocked out at the end of their shift you can manually clock them out yourself. To do this navigate to Manager Home > Reports > Labor > On The Clock. Select the start and end dates that you would like to run the report on and click Generate. Once the report has been generated you will be able to see everyone who has clocked in on the dates that you ran the report for. 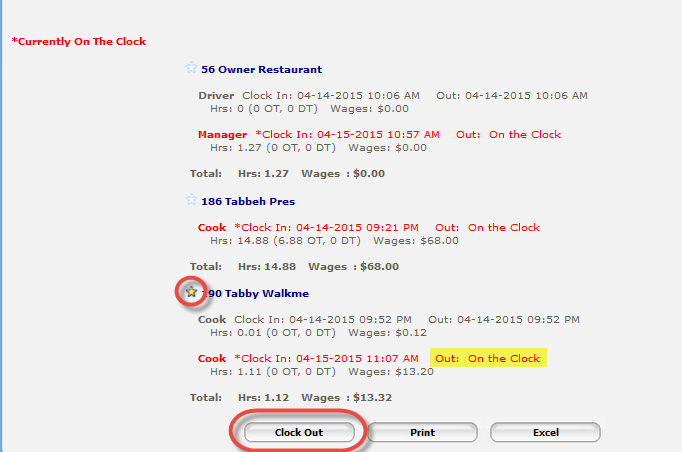 You will be able to see what time and date they clocked in and when they clocked out. If they are not clocked out it will say "On the clock." To clock the employee out click on the star next to their name and then the "Clock Out" button. One the screen refreshes the employee will show as clocked out. In some cases an employee might still have a register assigned to them. If this is the case you will not be able to clock them out until the drawer has been closed. To learn more about how to resolve this issue you can read the "Troubleshooting - I Can't Clock Out My Employee" article.